As the popularity of vinyl siding increases among homeowners, manufacturers have met a consumer demand for more vinyl siding styles and colors and are now offering a wider range of siding products than ever before. When choosing a vinyl siding color for your home, you keep in mind that not all colors are available for every style or manufacturer. Your home's exterior is the most noticeable portion of your house. You should choose a color that offers curb appeal but also suits your personal taste. Neighborhood aesthetics. You should choose a color that blends well with the other homes in your neighborhood, paying special attention to the houses directly adjacent to your own. Choose a color that complements neighboring houses by selecting one with the same tone (earth tones, blues, whites, etc. 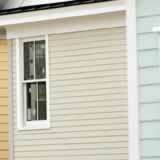 ), but avoid choosing a vinyl siding color that closely resembles your neighbor's house. Architectural style. The style of your home should help dictate the color of siding you choose. Traditional homes like New England colonials and Greek revivals look best with sidings that are white, cream, or beige. Darker colors, such as reds and browns are better suited for arts and crafts-style homes, western bungalows, or mission revivals. Natural environment. Select a siding color which acknowledges the natural world around your home. Vinyl log siding may look out of place in an urban neighborhood, while bright white clapboards may stand out for all the wrong reasons in the deserts of the Southwest. If you want a colorful house, you still can go neutral when choosing a vinyl siding color, while highlighting your home's exterior with a colorful trim or front door. This will help with eventual saleability of your home. Large expanses of siding can be visually minimized by opting for a lighter color, which can enhance your home's landscaping and surrounding property. Choosing a vinyl siding color for your home is a big decision, and you should consider all the elements that help create a pleasant exterior before you choose.